Forms of dance styles, where socializing is the primary focus of the dancing. Style of dance in which dance competition is the main focus. Couples perform several dances in front of judges who score and evaluate the performed routine. It is referred to a wide variety of partner dances. It includes Latin (also termed Rhythm) dances such as Rumba, Cha, Cha, Swing, Mambo, Salsa, Bachata and Standard (also termed Smooth) dances as Waltz, Fox trot, Tango, Viennese Waltz, Quickstep and etc. Ballroom dancing offers so many different styles of dances that are used in Social and Competitive level. The word Rumba is a generic term, covering a variety of names (i.e., Son, Damson, Guairá, Guaracha, Naningo), for a type of West Indian music or dancing. The exact meaning varies from island to island. The word "rumba" comes from the verb "rumbear" which means going to parties, dancing, and having a good time. The Rumba evolved in Cuba during the 16th century and was influenced by the African slaves. Even though that the dance was considered Cuban, versions of it were popular in the Caribbean islands and in Latin America. In the late 1920's, Xavier Cugat formed an orchestra that specialized in Latin American music and introduced Rumba into the USA. In 1930 the dance was popular in London. Rumba is danced in 4/4 timing and the characteristics of the dance display a sensuous hip movement and a sense of flirtation between man and a lady. The rhythm and body expression make the dance popular to dance in any formal and informal events. Originally known as the Cha-Cha-Cha, the dance evolved from the Mambo. It was born in Cuba and it was introduced to the west in 1947 and it became popular about 1954. The dance is performed in 4/4 timing and the music has a syncopation on beat 4 where it is known as a cha-cha-cha. The character of the dance is lively, energetic and flirty. It is often called the dance of “ the leg action” because legs and hips are used to perform a strong rhythmical movement that reflects the energy of the music. Cha-Cha is a dance that is easily adaptable to modern music that is why it does not lose its popularity. Known as Triple Swing, East Coast Swing is a true “American Dance. A descendent of Lindy Hop and Jitterbug, E. C. Swing dates back to the 1920’s where it was popular in African America communities who danced Charleston and Lindy Hop to Jazz music. Later it was developed into “Ragtime” and then “Swing” music. During World War II Swing was introduced to Britain, together with the famous orchestras of the day, such as Benny Goodman, Tommy Dorsey and Glen Miler. After the end of the war, the fastest version remained in Europe where it was known as Jive. Swing continues to be danced everywhere among all ages and groups as music is available from all eras. The timing of Swing is 4/4 and the character is very lively and fast. East Coast Swing is a stationary dance that has a “swing” action and a slight “bounce” effect. Typical movements for the dance are spins, kicks, underarm turns and changes of timing and rhythm. The West Coast Swing evolved into a “Slot” dance where more people can participate in a small area. The timing is 4/4 and the music can be any slow swing style or varieties of Rock and Roll and Country Western. The character of the dance is slow, danced in a slot, without any bounce. Typical moves are turns and spins danced in a slot. A lot of maneuvers with changing partners dance positions. Born in Brazil during the 19th century, the dance Samba expresses the celebration of the free spirited festivity of the Carnival in Rio De Janeiro. Around 1930’s Samba was introduced in the U.S by the unique moves of Carmen Miranda. The major action of Samba is called the “Samba bounce” that gives the dance a unique look and feel. The basic footwork of the dance includes fast weight change with a knee lift. The hip movement of the body is also unique and it is used often for work out exercises. Samba music has a distinctive rhythm that provokes energetic movement. The Mambo originated in Cuba where it had a serious influence by the settlement of Haitians. In Haiti the “Mambo” was a voodoo priestess who was a spiritual advisor. The combination of Swing and Cuban music produced the fascinating rhythm of Mambo. The dance was introduced in 1943 at La Tropicana night-club in Havana by Perez Prado. Few years later it became popular in New York and there were movies and songs made that kept it success. Danced in 4/4 timing, the Mambo was played originally as any Rumba. It was described as a fast Rumba. The influence of Swing, Jazz and Latin music made the dance very distinct. Popular Mambo songs are “Mambo Italiano”, “Papa loves Mambo”, “Mambo #5”. The popularity of the dance was featured by Eddie Torres, a New York dance professional, who was pronounced as a “Mambo King”. Torres believed in “the authentic night club style of mambo dancing, which in the 1990’s was known as Salsa”. 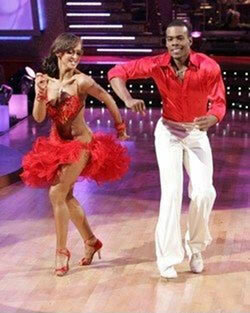 As many other dances that came from Cuba and the Caribbean, the Bolero has a Spanish/African roots. It is often connected with Rumba but the character of the dance is even slower and more dramatic. Danced in 4/4 timing Bolero’s typical movement has rise and fall action that expresses a sensuous love between the partners. Turns, breaks and wrapping type movements are usually seen in that dance. The music is slow and romantic. The Merengue is the national dance of Dominican Republic. There are two stories told about this dance’s origination. The first tales says that a Dominican solder that was wounded in one leg was limping, and the rest of the people that did not wanted to offend him, copied the hero out of sympathy. The second story says that chained slaves working on a sugar field cutting down the cane. They had to take small side steps so they can move together. However the Merengue was popular in the Dominican Republic in the 1800’s. This dance is very energetic and easy to learn. The 2/4 timing helps the movement and the dynamic of the dance. As a Caribbean dance the Merengue is danced with a lot of hip action and it is a great dance for exercise. The origin of the dance leads to where the country dance called “Danzon” was brought by the French to Haiti. The influence of African, Cuban and Spanish troubadour made the dance a partner dance, danced to the beat of a clave. Bachata originated in Dominican Republic and evolved in the early 1960’s as a romantic guitar music. Later Bachata was formed as a dance with new steps and a character totally different than Salsa or Merengue. Latin American and Spanish people described Bachata as a fun and merriment dance. The evolution of the Bachata has been through a series of different phases. The music was played by rural musicians that were viewed as a lower quality. The style was called Bachatero and it was associated with alcohol, womanizing and violence. Jose Manuel Calderon changed the reputation of the Bachata, recording the first song “Borracho de amor”. The song was romantic and close to the Bolero. During the 1980’s Bachata again was a target of criticism because of it lyrics that had a sexual meaning. In the 90’s singers as Juan Luis Gierra, Luis Vargas, Anthony Santos made the Bachata more acceptable. In the late 90’s Aventura, a Dominican group from New York, attracted international audiences. Bachata dance now is danced side to side or forward and back. A lot of the dance steps can be close to Salsa or Merengue but the three dances differ from each other. The Bachata is very romantic dance and it has a distinct hip movement that is typical for the Caribbean dances. The name “Hustle” was originally a Line dance. The partner dance style was also called the “Hustle” especially after the movie “Saturday Night Fever”. Latin music and Swing were mixed into the new modern Disco beat. No one knew what to call it and it had many different names. During the 70’s the Hustle was called “Disco Swing”, “Rope Hustle”, “Sling Hustle”, “Street Hustle”, “Latin Hustle” etc. Accordingly to dancers from the 70’s the Hustle dance was immediately linked to the night clubs. Famous locations were Studio 54, Ipanema, Boomba etc. In Buffalo the most popular Disco event of the year is The World Largest Disco. “Colorful flowing ball gowns”! “Tails”! “Weddings”! “Beautiful music”! “Strong melodies”! 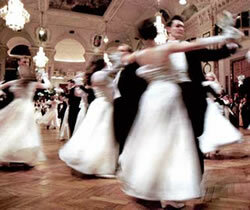 Waltz originated from the German word walzen to roll, turn or glide. The dance was born in the suburbs of Vienna and in the alpine region of Austria during the 17th century. It was danced in ballrooms of the Hapsburg court. During the 18th century the Waltz was popular in France, where it was danced with arms intertwining at shoulder level. By the end of the 18th century, the old Austrian peasant dance had been accepted by the high society. In the U.S. the Waltz was danced in Boston in 1834 and by the end of the 19th century the dance was established in United States society. Danced in ¾ timing, the music has even beats, however the accent is always on the first beat. The character of the dance is elegant and graceful. Turns, progression, rise and fall are the typical dance movement for that style, as well as sway and shaping. The music and movement are great for relaxation and stress relieve. Originated in the Victorian era as the “One step” or “Two step”, the Fox trot was later introduced as the “Castle Walk” by the famous American performers Vernon and Irene Castle. In 1913 Henry Fox performed a little Trot, which appealed to the social dance teachers in New York. That’s how Fox Trot was born. It has gone many changes since that time and now the dance is much smoother and softer. Danced in 4/4 timing the music is usually is connected with the “big band music”. At a beginner level the dance can be slightly bounce but as it progresses the dance evolves as a continuous undulating movement. The rise and fall should not be as pronounced as the Waltz but it should be apparent. The Tango- “one of the most fascinating of all dances”. 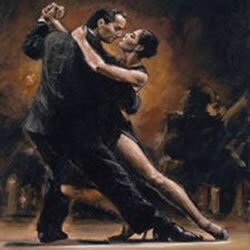 Originated in Spain or Morocco, the Tango was introduced to the New World by the Spanish sttlers. The Tango became very popular in the bordellos of Buenos Aires. The story of Tango was told that it all started with the gauchos of Argentina. They would go to the local night clubs and ask the local girls to dance with them. The men danced in circles because the floor was small with round tables. During the 1900’s the dance became popular in Europe. In 1921 Rudolph valentine made the Tango a hit in New York. Styles vary in Tango: Argentine, French, Gaucho and International. Still Tango has become one of the American Standards regardless it’s origin. The American version is a combination of the best part of each. Danced in 4/4 timing, the character of the music is staccato and imparts a sense of strength and drama to the dancers. The hold is very different from the other dances. The lady’s left arm is “locked” under man’s right arm and that creates firmer connection between the partners. The hold allows the couple to move staccato and to execute dramatic movement. The Tango should not be confused with Argentine Tango. On May 25 1810, the citizens of Buenos Aires established a provincial government. On July 9, 1816 independence from the Spanish Empire was declared but it was recognized 1862. The Argentine Tango came to life in the bordellos on the back streets of Buenos Aires. They had different functions and were called Academies de Dance. At that time the dance was rejected by the upper class of Buenos Aires society, as a dirty street dance. Around 1800, a new instrument from Germany arrived, the Bandoneon. The instrument was connected to the Tango, from then to now days. Argentine Tango is danced with energy between the partners. It expresses a seduction, private conversation, something to be quietly shared. Commonly believed that V. Waltz was originated in Austria in early 1800’s, it is known that a similar dance was popular in France. The dance with same characteristics was born in 1500’s and it was popular among the French peasants. The dance at that time was named the “Volta”, (Italian for turn). The Viennese Waltz that we know now was immortalized in the 1800’s by the music of the composers as Joseph Lanner and Johan Strauss. In the middle of the 20th century, the German, Paul Krebs choreographed the Viennese waltz style to which we dance today. The dance is popular not only in Europe but also in America and it has been used in many Hollywood movies. Dance in 3/4 timing, the music is three times faster than a Waltz. The dance progresses in a counter-clockwise direction and moves fast around the floor. In 1920’s Quickstep evolved from a combination of dances as Fox Trot, Charleston, Shag, Peabody and One-Step. It has English origin and it was standardized as a separate dance in 1927. The tempo of the dance is fast and it was developed from the ragtime era and jazz. The Quickstep is elegant dance like the Fox trot. The dancers should be light on their feet because of the high speed and energy level of the music. The Polka originated in the middle of the 19th century in Bohemia (Czech Republic). The dance was popular in Central Europe, Poland, Latvia, Slovenia, Croatia, etc. By 1835 it had spread to the ballrooms of Prague. In 1844 it was introduced to America. One of the types found in U.S. is the North American “Polish-style polka” which has roots in Chicago. Polka is a fast energetic dance that travels around the floor. Turns and spins are typical for that style. Belly dance is an expressive dance which emphasizes complex movements of the torso. Originally a Middle Eastern folk dance, it has evolved to take many different forms depending on the country and region, both in costume and dance style. New styles have been spread from the Middle East to the whole world where its popularity has becoming more and more popular. Cabaret dance style is a form of entertainment featuring comedy, song, dance, and theatre, distinguished mainly by the performance venue—a restaurant or nightclub with a stage for performances and the audience sitting at tables (often dining or drinking) watching the performance being introduced by a master of ceremonies or emcee.